Continuing education for new grad occupational therapists is not only beneficial to grow as clinicians, but it's also important to maintain our licensure (and job). 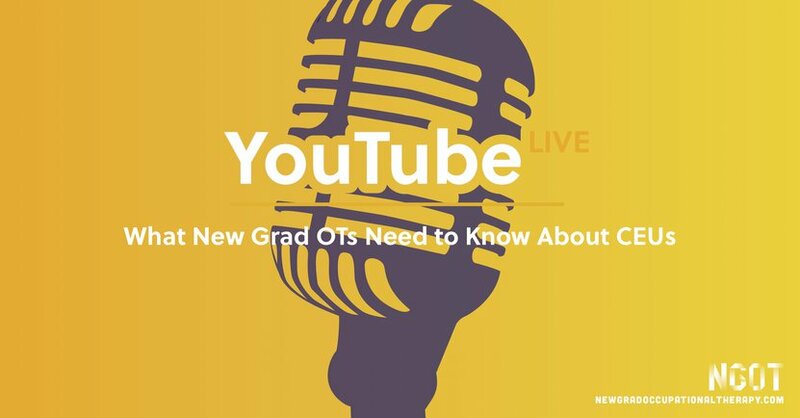 We hosted a YouTube Live on July 31st at 3pm PST, where recent graduate and NGOT Publication Director Dominic Lloyd-Randolfi, OTD, OTR/L sat down with Meredyth Given from Medbridge Education. When do you need to start taking Continuing Education Units? How many do I need to keep working? Is there a difference between national licensure and state licensure? What is the difference between CEUs and PDUs? Should I take courses online or hands on and in person? How many years after school should I look in to taking CEU courses? How do I know my CEUs are approved by AOTA and my state? I get CEUs mailed to me, are these legit? What should I do to keep track of my CEUs and licensure?